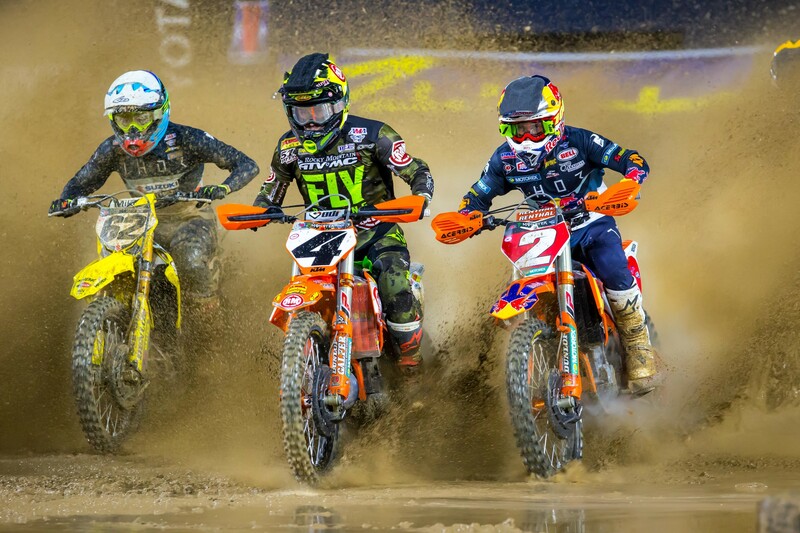 If we’ve learned anything from the 2019 season of Monster Energy Supercross it’s that we really have no idea what to expect when the gate drops for the main events. 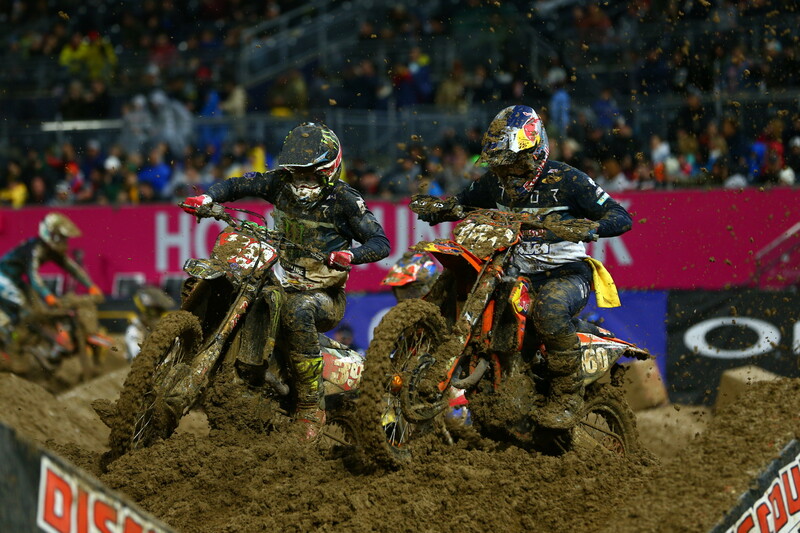 The results have been anything but predictable lately and when the San Diego skies opened up and absolutely drenched the track right before qualifying, it seemed we were in for yet another night of uncertainty. So how exactly did it all pan out? Let’s get into it and find out! First off, it cannot be understated just how muddy it was out there. The rain started at almost the exact moment the tarps came off the track, and after about fifteen minutes of steady, manageable precipitation it started coming down in earnest. It was like someone had turned over a gigantic bucket in the sky. Sheets of rain dropped from the clouds, completely ruining any chance the track crew had of preserving a decent race track. The sheer volume of rain eventually decreased, but it continued to fall for a few hours, which created a muddy mess of a track. It was so bad that the riders were rolling almost every single jump and everywhere you looked guys were falling down. In the KTM Junior Supercross Challenge the bikes didn’t even make it a quarter of the way around the track before every single bike got stuck. It was gnarly out there! 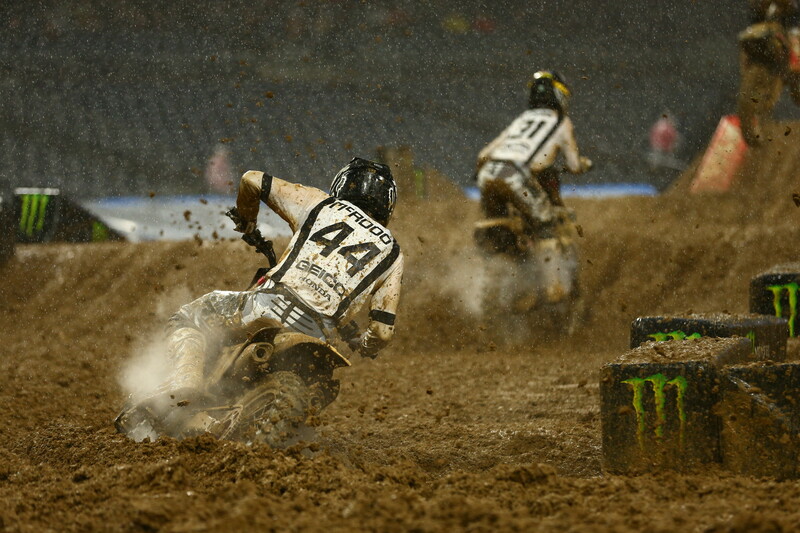 Not surprisingly, the track didn’t permit for any real battling and most of the guys were simply riding for survival. 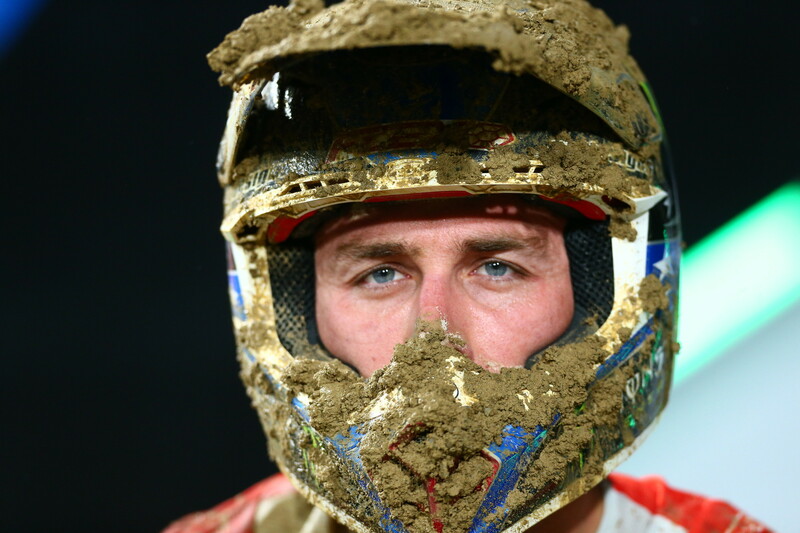 That’s probably just fine with Eli Tomac though, who was fastest in practice, won his heat race, and picked up his first 450SX win in 2019. 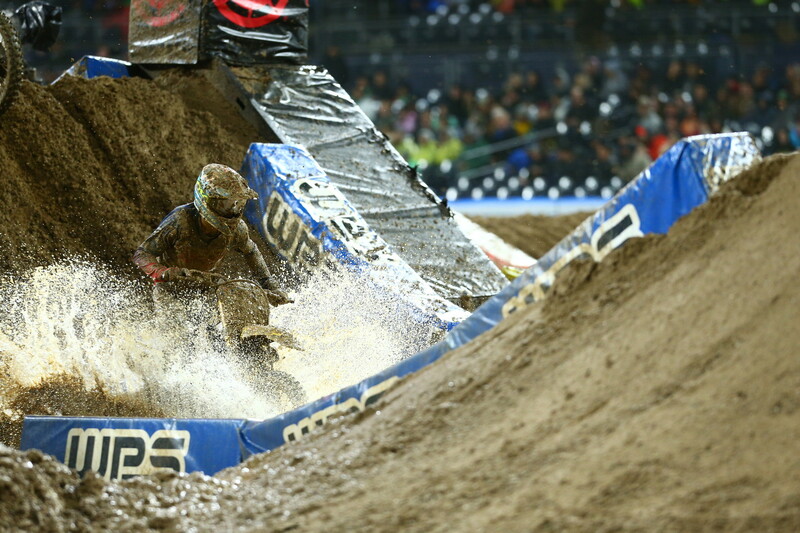 The Monster Energy Kawasaki rider was able to get a good start, took the lead, and started checking out. It didn’t take him long to build a big lead either, which he’d end up needing because he made a mistake later and had a little mishap. 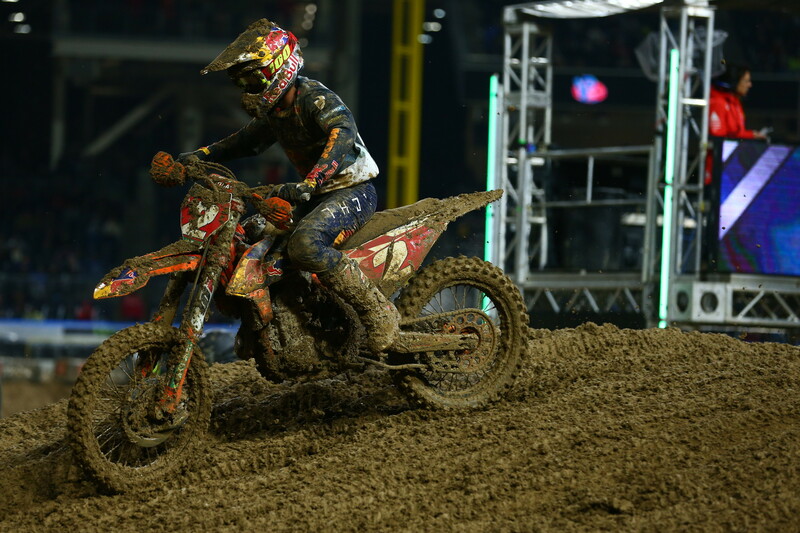 He was able to get going again without losing the lead, but both Marvin Musquin and Ken Roczen closed on him quite a bit on the final lap. 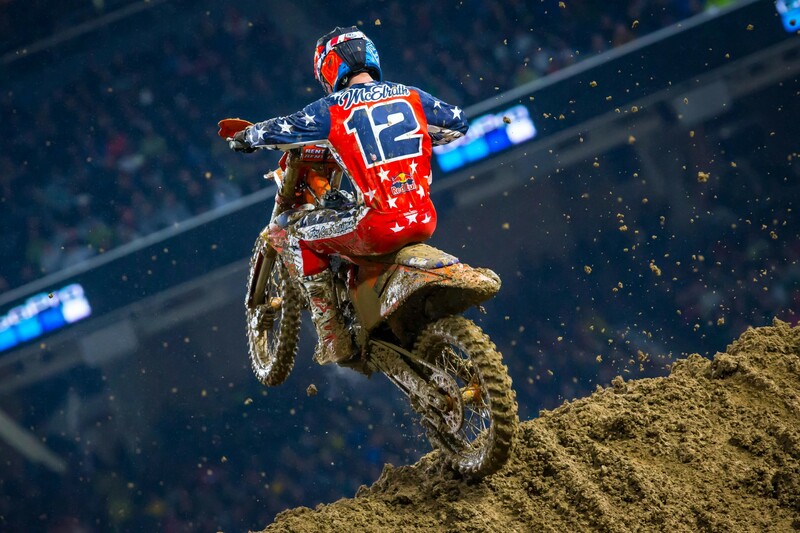 It was another good night for Musquin, who passed Roczen late in the race and finished second. It’s his third second-place in a row, and is a departure from the first two races in which he didn’t quite seem like himself. Afterward he said his knee, which he injured before the season, feels much better now and he’s been able to get back to his normal routine during the week. 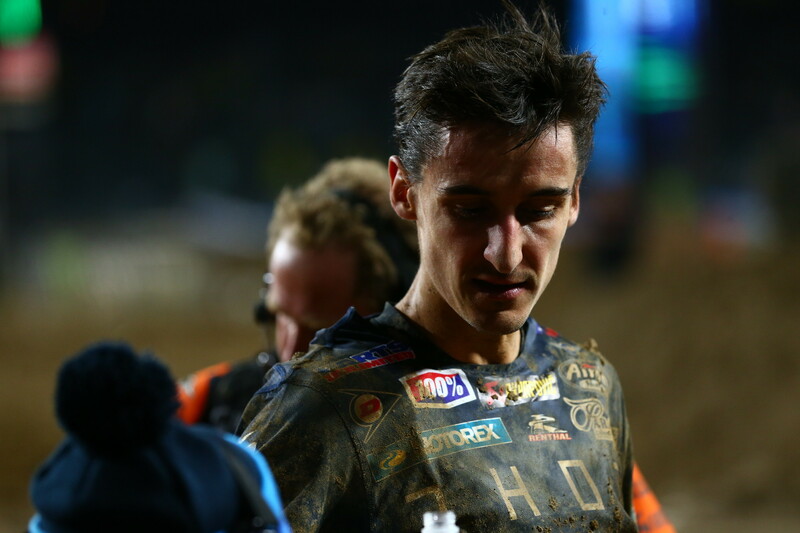 Unlike Tomac, Musquin didn’t benefit from a good start and had to work his way forward through terrible conditions. Had you told Ken Roczen before the main event he was going to end up in third he probably would have been just fine with that. After all, mud races have the potential to wreak havoc on results, and getting on the podium on a night like tonight is a victory in itself. But at the same time, it probably stung a little for Roczen, who got the holeshot but ended up crashing almost right away. 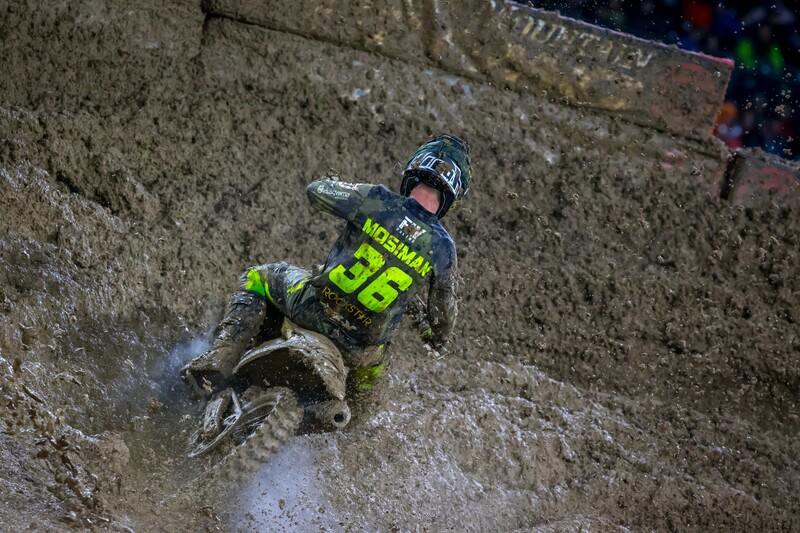 He was able to work back into second place but ended up surrendering the spot to Musquin on the last lap. Credit to Justin Bogle, who ran second for the first eight laps. Had he been able to avoid crashing he may have even been able to finish on the podium. He ended up fourth, which is still a great result and is far better than where he finished at any of the first four races. 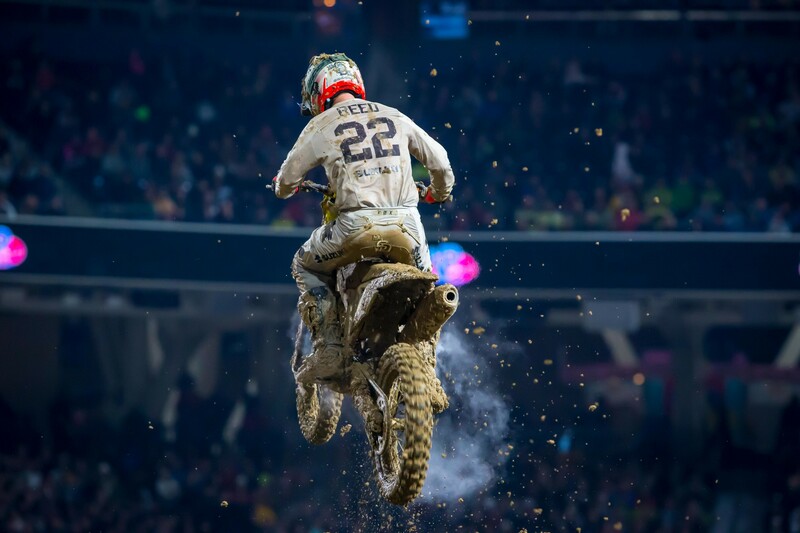 Chad Reed also produced his best result of the season with fifth. If you’re wondering where Justin Hill was tonight the answer is the hospital. He crashed in practice and took a handlebar to the stomach. He was in pain afterward and went to the Alpinestars Medical Rig to get checked out. There were some concerns over a possible enlarged spleen, which resulted in a visit to the hospital for Hill. Fortunately he eventually checked out okay and was released. 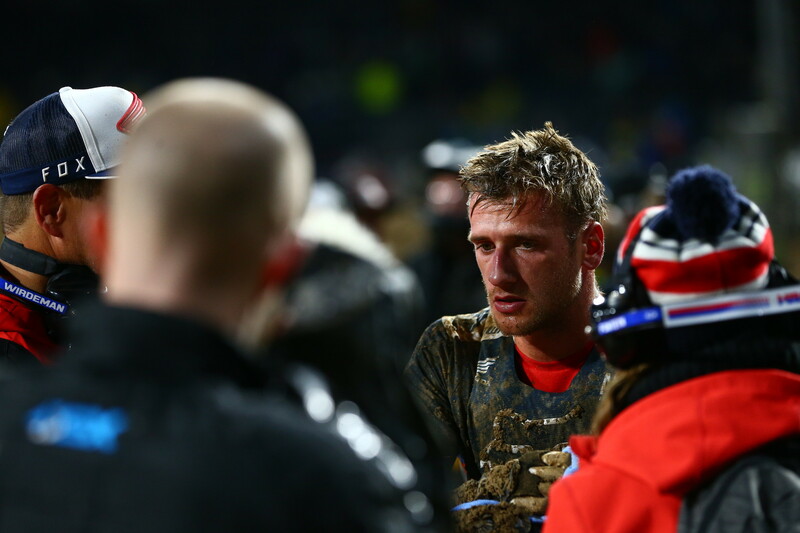 Justin Barcia’s night was not great. He was running third early in the race but ended up developing some kind of bike problem and ended up joining the DNF club. We checked with the team afterward and were told they suspected it had something to do with the clutch, but hadn’t checked yet. 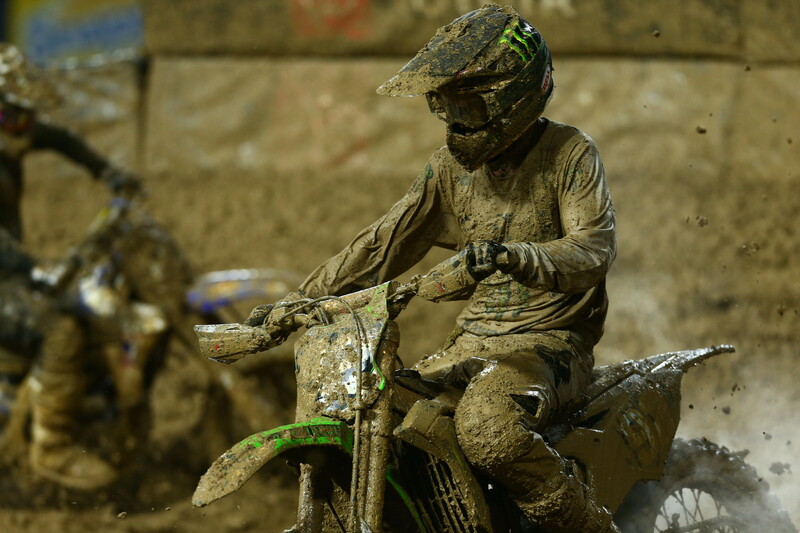 In 250SX action it was Adam Cianciarulo’s night yet again. 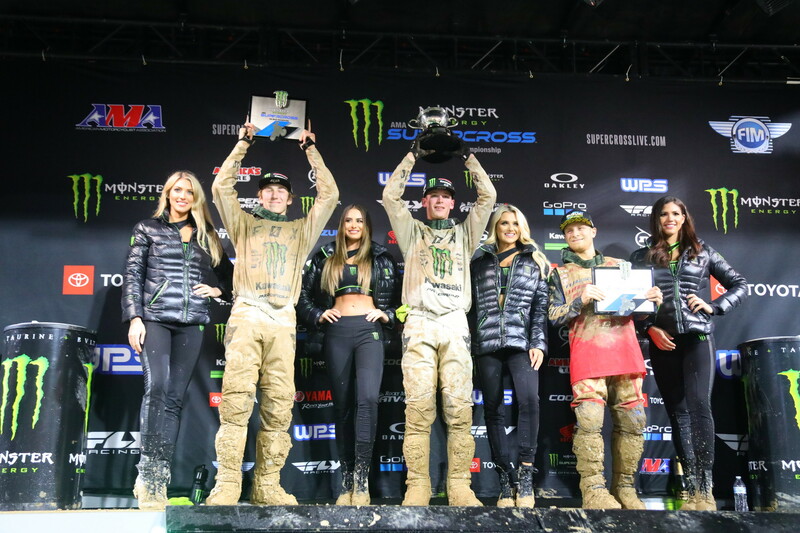 The Monster Energy/Pro Circuit/Kawasaki rider was perfect in the laps led category and scored a fantastic wire-to-wire victory. 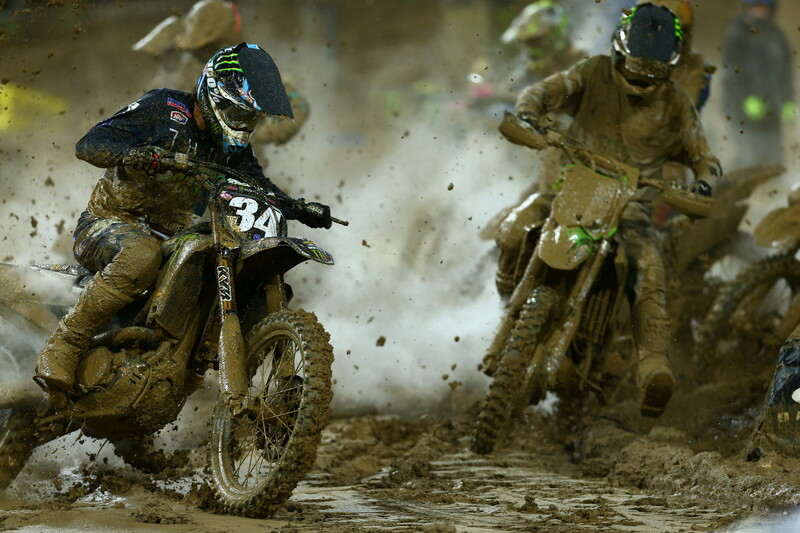 Nobody ever got close to challenging him and he won the race by a comfortable margin over his teammate Garrett Marchbanks, who scored second. 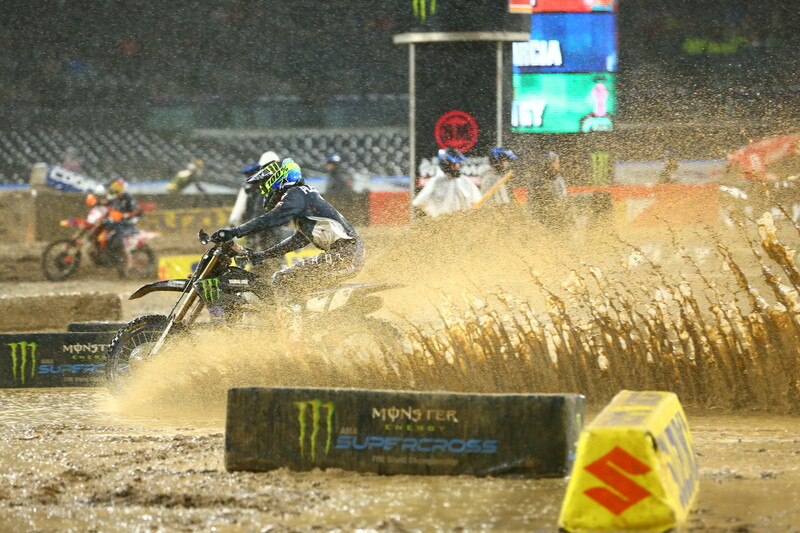 It’s by far the best supercross result for Marchbanks, who previously hadn’t finished higher than sixth. Jimmy Decotis put JGRMX/Yoshimura/Factory Suzuki Racing on the podium by nabbing third, but he didn’t even realize it at first. He’d been running fourth, which is where he thought he’d finished the race because he didn’t notice Dylan Ferrandis, who was in third, had developed a mechanical problem (a suspected clutch issue) on the final lap and DNF’d. It’s great timing for Decotis, who had a great night going last week before going down in the main. Despite not finishing the race Ferrandis didn’t make out as bad as he could have. Even with the shortened main events Ferrandis had lapped enough riders that he ended up taking seventh place. Not what a rider of Ferrandis’ caliber wants, but not too bad either, all things considered. 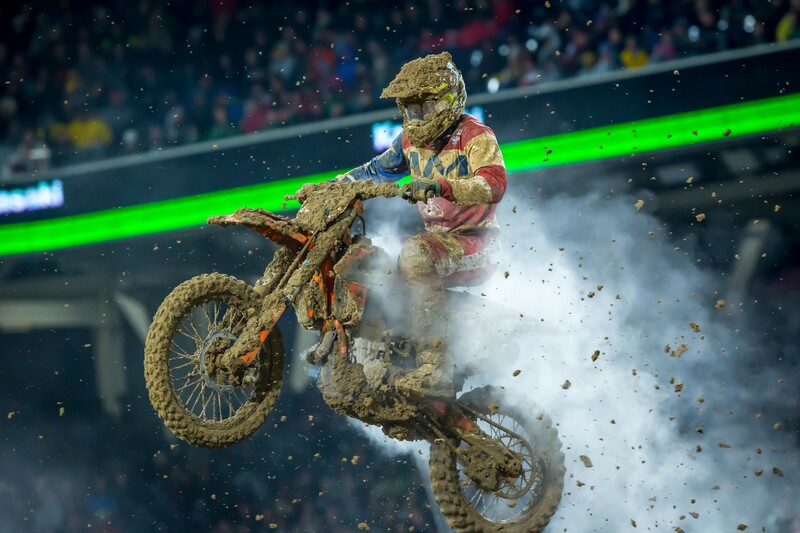 Hats off to Shane McElrath, who fought forward on a track that was extremely treacherous. After one lap he was in nineteenth place, but by the time the race ended he’d managed to work all the way up to fourth place to salvage extremely valuable championship points. Canadian rider Jess Pettis logged the best result of his career when he crossed the line in fifth. The result moved him into the top ten in points, and he is now hoping to be able to complete the entire 250SX West series instead of just the first leg, which is what his original plan was. It was an disaster of a night for Colt Nichols. The Yamaha rider came into the night with the red plate and was running second early in the race before spinning out and losing a whole bunch of spots. He ended the night in tenth and is now ten points out of first place.